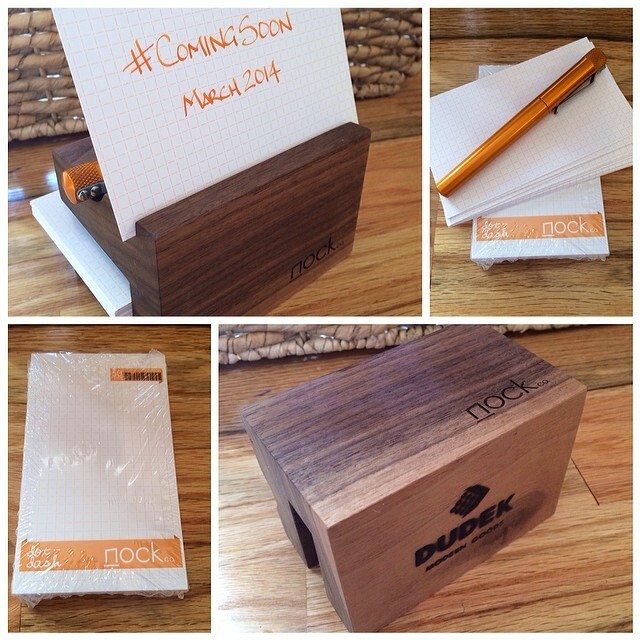 Tech Type #4: My Paper Education — Nock Co. This is the fourth entry in our Tech Type series where we explore the technical aspects of our products. For this episode I will be discussing the thoughts that led to us creating our note cards. It's been leaked like the picture of the hottest celebrity wardrobe malfunction - we have note cards! As we race to finish our Kickstarter cases it is time to show you some upcoming items. Brad dropped the bomb of our Nock Co. DotDash Note Cards and Dudek Modern Goods Idea Dock recently, but designing them wasn't as easy as ordering from VistaPrint. When we were brainstorming about what we could do outside of cases, we ran through a few different terrible ideas before deciding on paper. While the Kickstarter was funding we had some down time to work on some of these things. This was the first time I have even thought of paper being designed. Lines on a piece of paper are taken for granted because we are so used to it from our early education. Once it occurred to me that someone designed this and deemed it a viable pattern to increase learning and organization, as Dowdy would say, "It was on." We've be writing on ruled paper since the late 1700's - time to step your game up to the DotDash. For daily use, the pattern was important. Something easy on the eyes but allowing for high functionality. Many people use graph/grid paper and more are using dot-grid paper than ever before. With DotDash we wanted something that offered a mix. Using the dash over the standard grid allows a visual break giving you more time to think about what's next. All of this happens in milliseconds, but it's a nice middle ground from the dot grid needing structure but with less mess than a traditional graph. Color-wise there are endless possibilities, from blue to purple to green to grey. Why did we go with the Pantone color that we did? Because Brad likes orange (We are testing other colors for future releases.) We use a brilliant white paper stock to keep anything you write legible and crisp. The paper is printed locally in Atlanta, GA, USA from a third generation printer. He helped us find the correct ink to prevent line separation on the printed pattern which is an added bonus. Standard American note card size. Why? Note cards were originally created by for Hypertext in the mid 1980's. This makes it one of the most universally accepted sizes of modern paper. There are a few other sizes on the market but we went with the good 'ol 3"x5". This did two things well: Fit in the same cases that hold standard memo books, and fit in most jacket & handbag pockets. This is the nitty gritty to why we think we have a place in this market. Out of the popular note cards, very few are fountain pen and micro gel friendly. This takes into consideration bleed, feathering, friction, and stiffness. Some index cards are quite thick and sturdy to a fault. This is where working with a family of printers showed its worth. We decided to go with an 80lb cover stock for our cards. This allows for a sturdy card, no bleeding, and keeps feathering to a minimum, even with the wettest of pens. Feathering is affected in part by the GSM of paper. I had no clue that meant Grains per Square Meter, or grammage. Our note cards have a GSM of 216. You don't have to have a clue about it either - just know our cards are smoooooth. Brad and I tried stacks of papers from different manufacturers to balance the smoothness and dry time. We think we nailed it. To get appropriate dry time there is chance of some feathering with very wet inks but this is the balance. As everyone knows there is a back and forth in the pen world where finding perfection means accepting small adjustments of desire. With these note cards we wanted to do something special, so we called on a good friend and started brainstorming. Mike Dudek from The Clicky Post worked out some slick Idea Docks for us to hold our cards and keep you looking fresh. We can't wait to unleash these to the public - stay tuned!